Mr. Boulton is a writer and a filmmaker. Mr. Heithaus is a poet. On Christmas Eve 1968, human beings orbited the moon for the first time. News of the feat of NASA’s Apollo 8 mission dominated the front page of The New York Times the next day. Tucked away below the fold was an essay by the poet Archibald MacLeish, a reflection inspired by what he’d seen and heard the night before. Even after 50 years, his prescient words speak of the humbling image we now had of Earth, an image captured in a photograph that wouldn’t be developed until the astronauts returned: “Earthrise,” taken by William Anders, one of the Apollo crew. In time, both essay and photo merged into an astonishing portrait: the gibbous Earth, radiantly blue, floating in depthless black space over a barren lunar horizon. A humbling image of how small we are — but even more, a breathtaking image of our lovely, fragile, irreplaceable home. The Earth as a treasure. The Earth as oasis. The message offered hope in a difficult time. Not far away on that same front page was a sobering report that the Christmas truce in Vietnam had been marred by violence. These were the last days of 1968, a divisive and bloody year. We’d lost Martin Luther King Jr. and Bobby Kennedy that year, gone through a tumultuous election, and continued fighting an unpopular and deadly war. Commander Borman himself compared Earth to an “aggie,” no doubt recalling playing marbles as a boy, drawing circles in the dirt. The famous “Blue Marble” image — one of the most reproduced photographs in human history — came four years later, from Apollo 17. But for Commander Borman and MacLeish alike, what “Earthrise” revealed wasn’t a marble made vast but a planet made small. A little blue sphere, a child’s precious aggie, floating alone in the abyss. Since then, we’ve learned a great deal more. When Voyager 1 took that picture, we weren’t yet sure whether there were any planets at all outside our solar system. But today, largely thanks to space telescopes peering out from Earth’s orbit, we know we look up at night into a galaxy with more planets than stars. We may now perceive, as never before, the Earth’s exquisite rarity and value. We live on a marvel to behold. We also know how our own DNA links us to one another and to life on our planet in general. We need not imagine ourselves as brothers and sisters, because science tells us that we are one family of life that includes plants, animals, birds, insects, fungi, even bacteria. All of life rides on Earth together. By the time Sagan delivered his message “to preserve and cherish” our planet, the awareness of our responsibility to care for the Earth had already taken hold. In 2018, it is virtually impossible to see “Earthrise” without thinking of the ways the planet’s biosphere — proportionally as thin as a coat of paint on a classroom globe — is not only fragile but also under sustained attack by human actions. It is hard not to conclude that we have utterly failed to uphold the grave responsibility that the Apollo 8 crew and “Earthrise” delivered to us. Our precious “raft” is losing members — species are dying — as our climate changes and our planet warms. The very technologies that flung us around the moon and back, the dazzling industrial genius that gave us fossil-fuel-fed transport and electricity, animal agriculture and all the rest, have fundamentally changed our Earth, and they now threaten to cook us into catastrophe. We may be afloat in MacLeish’s “eternal cold,” but what MacLeish couldn’t yet see was how, even then, we were madly stoking the furnace. 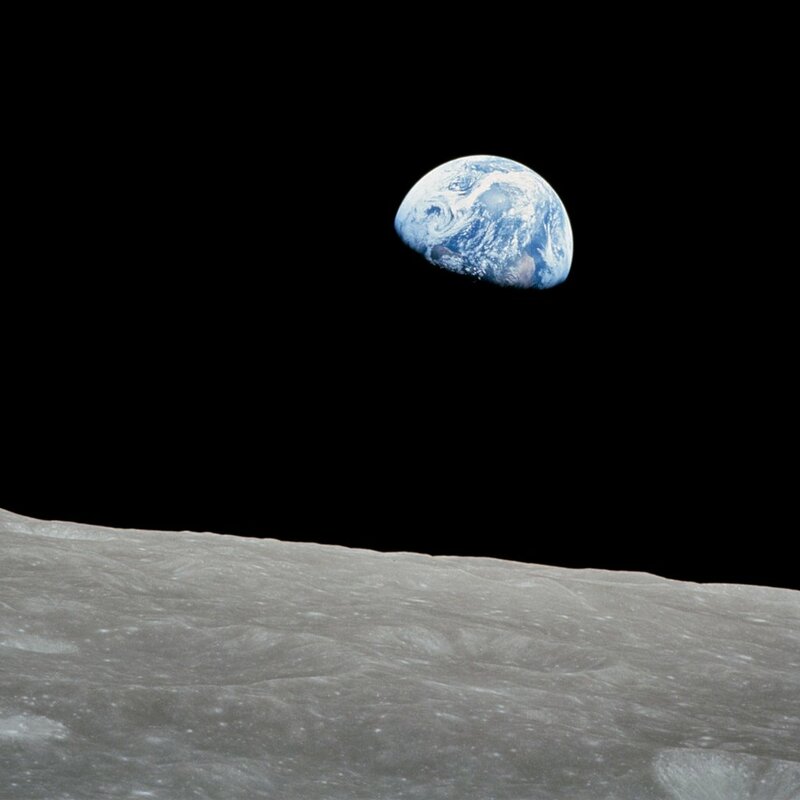 It’s all there in “Earthrise,” if we look closely enough. Those spiraling ribbons of clouds foreshadow the extreme weather to come. In the foreground, the gray moon testifies to how unforgiving the laws of nature can be. And behind the camera, so to speak, is the sprawling apparatus of the modern industrial age, spewing an insulating layer of haze around that little blue marble, the only home we’ve ever known. Today, against the backdrop of our enormous challenge in salvaging the Earth, MacLeish’s message almost seems quaint, if not dated. (He wrote of brothers, no sisters mentioned.) And yet, the poet still has a point. The vision of “Earthrise” is still one of awe and wonder. As we continue to venture out beyond Earth’s orbit, we citizens of Earth can at least hope that we will still be humbled by each new vision of our lonely planet from space. “And from the crew of Apollo 8,” said Commander Borman, signing off as the ship slipped around to the dark side of moon and out of broadcast contact, “good night, good luck, a Merry Christmas — and God bless all of you, all of you on the good Earth.” In the silence of the moon’s dark side, they later recalled, the skies appeared brighter and deeper — all except for the ink-black disc of the lifeless moon itself, blocking out the stars.